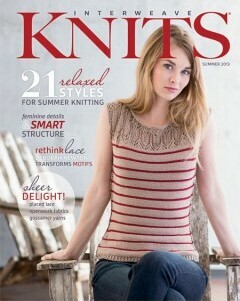 Get swept away with the Summer 2013 issue of Interweave Knits. They celebrate the best of warm weather knitting with 21 carefree projects that delight in breezy texture. Youll also take a look at unconventional silk blends, chat with rising star Amy Miller, and explore lace design with Deborah Newton.